NASCAR updated a bunch of its rules to try to make things a bit safer in the wake of the death of Kevin Ward, Jr. But if you thought that the tragic incident would've helped cooler heads previal, just for a little while, then you don't know NASCAR. Because Denny Hamlin just threw his HANS device at Kevin Harvick. Harvick had just made contact with Hamlin, sending Hamlin sliding off track and eventually into the wall, knocking him out of the race, and also managing to take a swipe out of Dale Earnhardt, Jr. It looked unintentional from Harvick's point of view, but Hamlin didn't see it that way, and he chucked the head restraint at Harvick to make his point known. 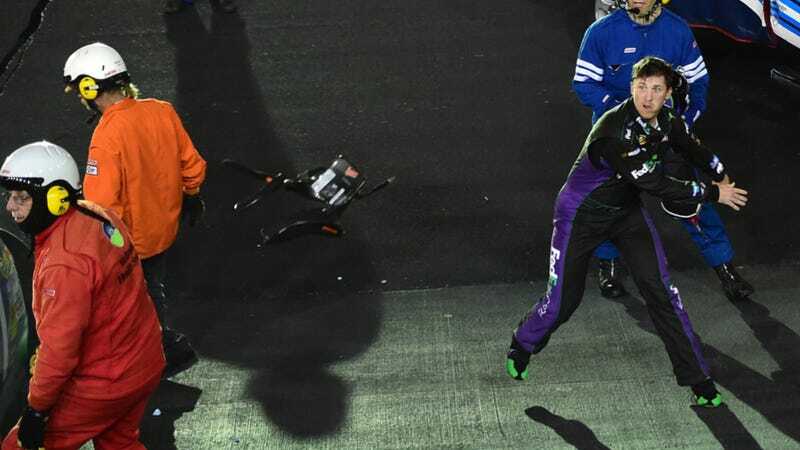 Whatever punishment Hamlin does or does not receive will probably depend on how these rules are interpreted, as NASCAR said that they'll be handling each incident on a case-by-case basis. Had track personnel already told him to remove his helmet and HANS device? Hamlin eventually got into a waiting ambulance, but the rules also say nothing about a brief equipment-chucking delay. And does this count as approaching the racing surface or another vehicle? Not sure if he's referring to his own mistake or Harvick's, but we'll find out soon enough.